Published by Sinclair-Stevenson in 1994: now only available through the author. On the demise of Sinclair-Stevenson Ltd. click here. “The three most powerful poems in this extremely inventive collection intertwine two lines of inquiry or play one sequence off against another . . . full of tension and vicious observations” Bill Greenwell, New Statesman. With the publication of his first collection, Beneath Tremendous Rain, Martyn Crucefix was hailed as “an incisive new voice” (The Times) and “an outstanding talent from whom great things can be expected” (Herbert Lomas/Ambit). His poetry was acclaimed as “distinctive” and “richly enjoyable” (TLS), capable of “fusing lush sensuality with a bred-in-the-bone seriousness” (City Limits). Anne Stevenson praised him for “daring to break with secular convention” and eagerly anticipated the fulfillment of his evident promise as “a real artist” (Stand). 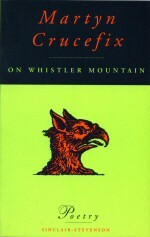 Crucefix’s new collection, On Whistler Mountain, fulfils and trumps these critics’ expectations. Here, the dead re-visit the living; a lover flies on real dove’s wings; an old soldier dreams he was one of the Magi; a computer programmer suffers a terrifying haunting. Wide-ranging, vivid and powerful, these poems leap sometimes shockingly, sometimes delightfully, into imaginative vision and, in doing so, Crucefix extends the remit of contemporary poetry. This new collection includes two ambitious longer works. ‘At The Mountjoy Hotel’, already recognised as a controversial poem, was a major prize-winner in the 1991 Observer/Arvon competition and was praised by Selima Hill: “The form, the language, the tone are spot-on. We feel we are in the hands of an expert”. The title poem combines the personal, mythical and political, interweaving themes of private loss with the horrors of modern warfare into an intense, almost Dantean, tour de force. begins to ring beneath his touch. between the hotel and St Mark’s. of silhouettes at the workshop door. splays white fire round their shoulders. the hand of an old-fashioned clock. of lunch, wine, a long afternoon. into the scorching heart of the kiln. where it ought to be ash. and swept at her knees with the back of her hand. to chase caterpillars from between the sheets. She mentioned her son. I’d known him at school. and never once wondered whether his mother knew. A hand suddenly flapped at the surrounding air. “He’ll marry soon”, she said, “I’m sure you will too? Though to tell you the truth, I’m not really so well. to flick at her breast, some troublesome spot. Out of touch for months and the rumour’s changed. above a flame. There was change in my pocket. and she was gone – silver dropping from my thumb.